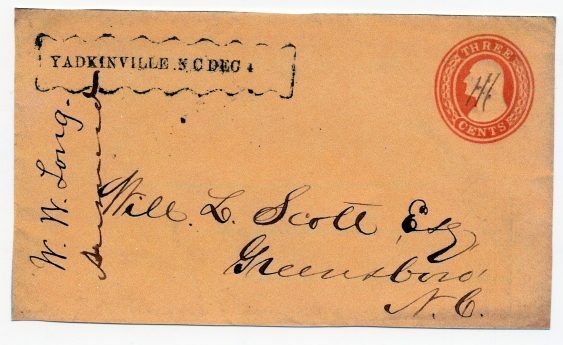 Yadkinville, NC, Dec. 4 ca 1860, Yadkinville opened its first post office on September 17, 1853. Some time after its third Postmaster William H. Rodwell was appointed on August 22, 1859. He began using this very unusual handstamp made from printers’ type, the scalloped edges around the town name makes for a very distinct handstamp. Straight edge postmarks are among the scarcest used in North Carolina. By August 9, 1860, a new handstamp device would be in use in Yadkinville.